I like my Huawei cell phone. Frankly, I don't care what the Cold War warriors and neocons in Washington say. Traveling from the US to lecture in China several times a year over the past decade taught me many things. One important lesson was that a cell phone is essential in China. I don't speak Chinese. So to coordinate directly with academic colleagues in Beijing, Shanghai, Nanjing or wherever a cell phone is efficient, the device is vital. Plus friends can message me in Chinese to show to a taxi driver or they can just give the cabbie directions on my phone. For several years, I used a basic Lenovo cell phone a Chinese colleague lent me and bought a China Mobile SIM card for my visits. So how did I get the Huawei? Well, I like tech and have a lot of audio equipment - analog and digital - for music and recording. I was giving a lecture at a seminar in Beijing in 2016 and a colleague had the Huawei P9 model which had just been released. The device was elegant, thin, modern and the screen generous and sharp with great color. She told me that the Leica camera lens produces really beautiful photos and that got my attention. As a photographer, I have owned Leicas and know their outstanding German quality. Leica cameras have a unique color profile and the images she showed me looked stunning. Another feature she noted is the dual SIM card capability. This is perfect for my professional use in the US and China and I can toggle back and forth depending on travel. Convinced that I should get a P9, I called a colleague the next day to help me purchase one. Conveniently, there was a shop nearby Renmin University, so off we went. I bought the Huawei and with a China Mobile SIM card I was good to go. The Huawei works flawlessly with great battery life both in China and the US and the pictures are superior. I still have my Apple 6S in a weatherproof case for personal use and for outdoor sports but the Huawei is the business phone with its bigger screen and better camera. Apple back in the day with Steve Jobs at the helm was an innovative and progressive company at the leading edge. But, sadly, the US innovator has slipped on many counts. Apple's clean white look was not original. It was derivative from the famous German industrial designer Dieter Rams (b. 1932) who pioneered sleek, modernist, all white product design style in the 1950s. His clean functionalist and minimalist style itself echoed the pioneering German Bauhaus School of the 1920s. Apple has not kept itself at the leading edge of innovation much to the dismay of its devotees not to mention the tech industry reviewers and critics. Concerns about inordinately high prices and the price-to-value aspect of Apple products has raised further questions. 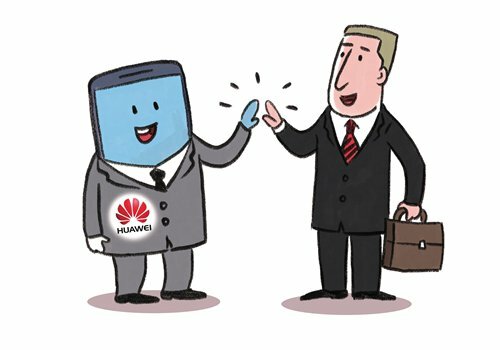 I bought the Huawei because of its excellent technology and because I felt it would be nice to have something from China that would remind me of friends, colleagues, and visits there. But what has been a practical high tech souvenir for me is now a symbol of the economic warfare between Washington and Beijing. The hysteria in Washington about China seems to know no bounds. Chinese consumers have many choices because products from all over the world are found there. The policy of reform and opening-up sparked intensive scientific research as well as great technological innovation. The pace of Chinese modernization is quite amazing as symbolized by its high speed railroads and advanced tech, including cell phones. The US can overplay its hand confronting China because Chinese consumers can easily react by shifting their purchases to domestic products or to third country merchandise. Apple sales which are slipping in China may portend the future. Meanwhile, I will stick to my Huawei cell phone.